I have the utmost respect for you. I and my son Malcolm actually started rooting for you and Seattle after watching you in the NFC Championship in 2014 against the San Francisco 49ers. Everything that transpired as far as the “thug” accusations and uproar from mainstream America that you sparked was an eye-opening lesson for Malcolm on how he will be perceived by society. He has long dreadlocks, loves sports, plays aggressively, and is passionate just like you. So when they were calling you a thug, disgrace, that you set black people back, 8-year-old Malcolm learned a very valuable lesson that will prepare him for life. He learned that perception becomes reality even if it is based on a false narrative. We watched how you handled everything with class, dignity, and poise. How you made them eat their words by showering them with not only intelligence but brilliance. They picked the perfect person to wrongfully call a thug. We followed you after that. Listened to your speeches. Rooted for your team. Bought your jersey as Malcolm wore it proudly. 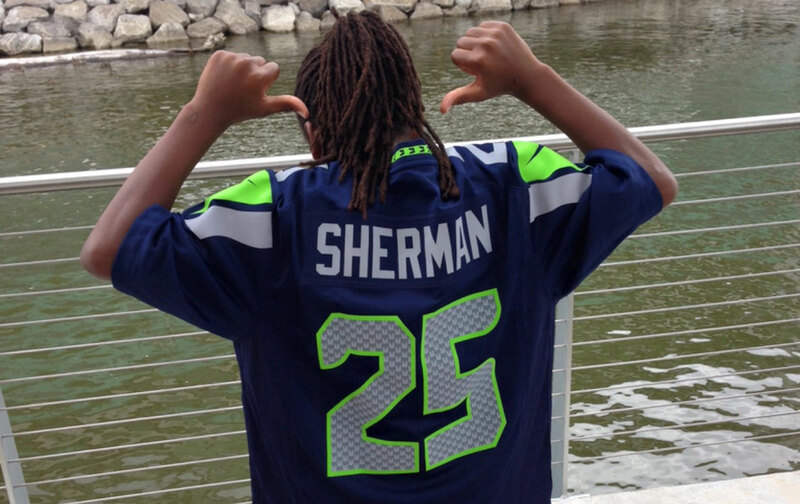 We became Richard Sherman fans. Your willingness to stand up for what you believe is a great example to all young athletes to follow your lead and use their positions as platforms. To give a voice to the voiceless in the tradition of Muhammad Ali, John Carlos, Tommie Smith, and Bill Russell. However, after seeing your press conference a few days ago where you discussed Black Lives Matter, I felt there was a lot that was left out in your address. It’s exactly what they have been waiting for and specifically what they want to hear. You are too brilliant to allow the media to twist and contort your message to mean what they want it to say. The fact is, people are capable of walking and chewing gum at the same time. You can fight against black-on-black crime and police brutality at the same time. You don’t have to pick one or the other. Black-on-black crime has become an often used phrase that has spewed from the mouths of Fox News and Bill O’Reilly and Sean Hannity as a feeble attempt to excuse police brutality or murders at the hands of the police. Nobody expected to hear anything remotely similar to that from Richard Sherman. Here’s a question to ask yourself: Why don’t we ever hear discussions about white-on-white crime ? According to Department of Justice statistics, 84 percent of white people killed every year are killed by other whites. In 2011, the number of cases in which white people killed other white people far exceeded the number of cases where black people killed other black people. In fact, between 1980 to 2008, a majority (53.3 percent) of gang-related murders were committed by white people, with a majority of the homicide victims being white as well. In America, whites commit the majority of crimes and are also responsible for a vast majority of violent crimes. In 2013, percentages of white people committing aggravated assault, larceny-theft, arson, weapons-carrying, vandalism, and sexual assault far exceeded any other group. But despite these facts, I have never heard any news media outlet express alarm over white-on-white crime. Why isn’t the entire white community indicted whenever a white person commits a crime ? Why are they looked at as individual instances, but if someone in the black community commits a crime, the entire community committed the crime as well? That false narrative has led to many believing the myth that all or most crimes are being committed by black people. But despite these statistics, as you said, too many murders are in fact being committed by black people against other black people. That’s an undeniable truth, and that is why many people, myself included, do in fact address murder, crime, delinquent behavior of any type in our own communities. Youth basketball, football, panel discussions, organizations, school visits, camps and speeches delivered to youth to discuss this very issue. You’re brilliant at it, and there are many more who are doing that same work. We definitely need to continue to encourage our young people to do the right thing as a whole. Some do and some don’t, but that still doesn’t excuse the police for treating everyone as a criminal. Racism, prejudice, and bigotry are all driven by false narratives. In our society, black children learn that they are presumed guilty thugs and dangerous threats because the often-reported on black-on-black crime has been drilled into their minds. That narrative is shown on a continuous reel every night on your local news channel, while white-on-white crime is rarely covered despite the actual statistics. As a result, whenever a black person is murdered by the police, the first thing mainstream America thinks is, oh, the police killed a thug who was probably involved in this black-on-black crime they keep hearing about. So they lack compassion. They don’t view it as the police murdering a human being; instead they say, well, let’s wait to see the facts first, because he may have been one of those thugs we have been hearing about. In addition, at the conclusion of almost every police murder of an unarmed black person, there is an an attempt by the media to demonize that murdered black person. He was “no angel.” They’ll show a mugshot-type picture of him, dig through his or her past to see if there is anything that could denigrate their character, all in an effort to push that same false narrative. I was glad that you stated that not all cops are criminals. You’re right. But not all black people are committing these black-on-black crimes you refer to either. Furthermore, if you are imploring us to not put the police all in the same boat (which we definitely shouldn’t do), you can’t make excuses for them putting us all in the same boat either. Less we forget, that is exactly what led to reporters around the country to call you a thug back in 2014. Did you have anything to do with black-on-black crime? Of course not. But that didn’t stop them from calling you a thug 625 times on TV. The fact is there is an issue with police practices in this country. When James Frascatore, the cop who slammed tennis player James Blake to the ground, has four civil cases pending for excessive force, and nobody in the NYPD asks whether he should still be in active duty, you have a much bigger problem. If the NYPD didn’t fire Officer Daniel Pantaleo for choking Eric Garner to death should we really expect to see them fire Officer James Frascatore for tackling James Blake? Understand this: When black people commit murder, more times than not, they go to jail. However, when the police commit murder of unarmed black people, even if it was caught on video, even if there are witnesses, even if the case appears to be the simplest open and shut case, the outcome is far too often suspension with pay, which is, in essence, a paid vacation. The result has usually been a not-guilty verdict or a non-indictment altogether. There is a much bigger issue with the way they police as a whole. We can’t allow anyone to excuse these types of actions as being understandable or acceptable because of the notion of black-on-black crime. Again, I understand your point about what we need to do in our community, but that is mutually exclusive of the fact that there is a much bigger problem that exists. Yes, as you said we’re all human beings, but the problem is we’re not all respected and treated as human beings. Case in point: When you have Michael Vick’s dogs receiving more justice than Mike Brown, Eric Garner, Trayvon Martin, Sandra Bland and Tamir Rice combined, you see exactly what society believes our lives are worth, and believe me, young black people are seeing that as well. So it’s up to us to impress upon them that, no matter what society tells them and shows them, their life matters. That in spite of every non-indictment, every not-guilty verdict after the police have murdered another unarmed black person, that their lives are important and that they matter. Not that society thinks that but that they have to believe that, and that they owe it to themselves to avoid the traps and pitfalls that have been purposely put in place for them to fall into. I am writing this with the utmost respect. Your voice is too powerful. You embody what we want athletes to aspire to become. Athletes who use their position as a platform and create change. Athletes who are unafraid to speak their minds and are unapologetic when it comes to standing up for what they believe in. But with that power comes great responsibility, and you have to choose your words very carefully, because a lot of people see that you’re special and take what you say to heart. Etan ThomasEtan Thomas is a former professional basketball player who played nine seasons in the NBA. He is also an author and radio host.